Comment: Beautiful Fall weather at Avenal once again. This time with good lift all afternoon. Everybody stayed up. Another beautiful Fall day at Avenal. An upper level trough passed through bringing in some cool air aloft, resulting in a good lapse rate. There were thermals all afternoon, with altitudes well over 4000 MSL easily achievable. Everybody who flew today was able to stay up. 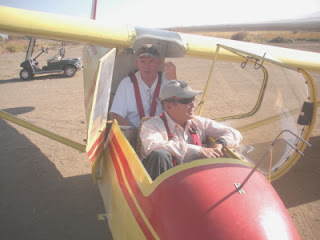 Martin Caskey is working on his commercial add on rating and was flying Big Bird from the back seat. We used the available lift to extend one of our flights to over an hour. 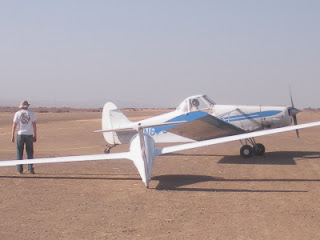 This allowed extra practice thermaling, flight at minimum controllable airspeed, stalls, steep turns and coordination. Note the vario, with the lift steady at 3 to 4 kts. We saw a few times where it briefly hit 5 kts. 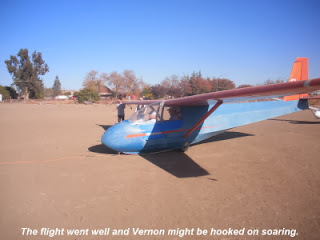 You may be able to see that we actually had a dreaded "yaw string malfunction", where the yaw string wrapped around the pitot tube and became useless. But, having the "right stuff", we kept our cool, did not panic, and it later untangled itself. Whew! 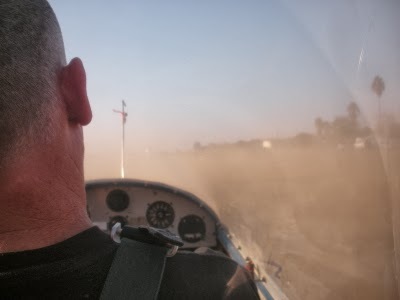 That adventure, combined with no longer having the house thermal "Tanks" to locate thermals, and for helping to navigate back to the airport really made this flight challenging! (Just kidding!). This is an image from the RASP forecast for today's Avenal sounding in a Skew-T diagram format. You can see that the usual low level inversion we get at this time of year was very weak, and the lapse rate above this weak inversion was quite steep up to about 5000ft. MSL. Even though the high temp. for the day was only about 65 deg. 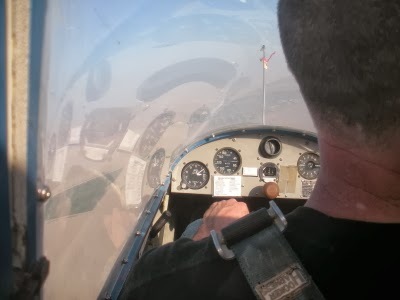 F., we were able to break through the low level inversion and thermals went up quite high for this time of year. 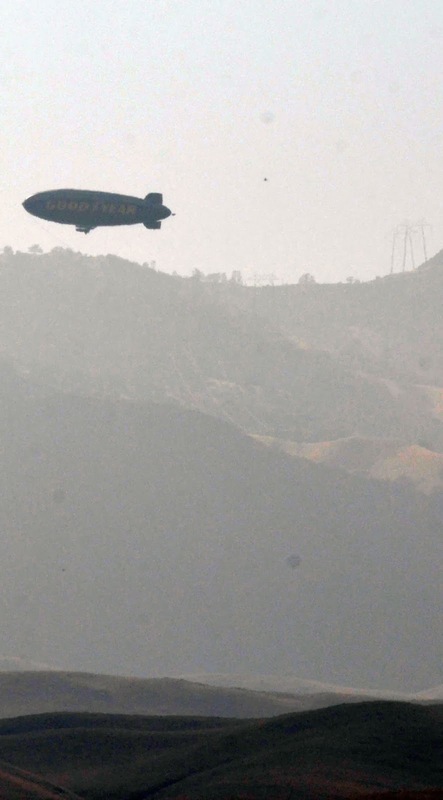 Saturday, November 9, 2013 Goodyear Blimp visits Avenal! Wind: 10 kts out of the South early, lighter but still out of the South later. Altitudes: 4000ft AGL off of tow. 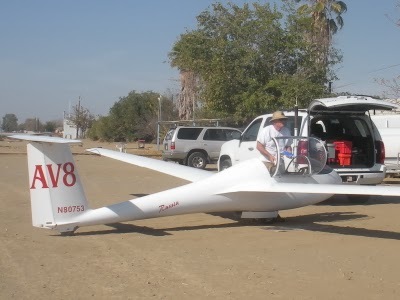 How many of you are familiar with 14 CFR 91.113(d)(2) (aircraft of different category on converging course, glider vs. airship) or ever thought you would have an opportunity or the need to test it? 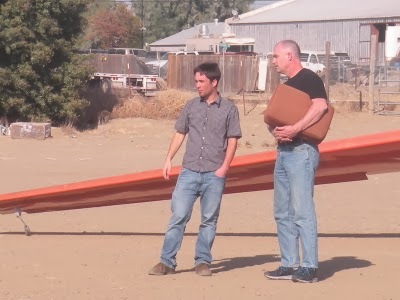 I thought I had seen a lot of things after over 40 years of flying gliders, but I was mistaken, when today the GOODYEAR BLIMP flew past the Avenal airport just as we were getting ready to launch! The wind was out of the south, and the blimp was traveling in a southerly direction. Probably it was trying to stay low and somewhat in the lee of the coastal mountains in order to stay in lighter headwinds, it was traveling South parallel to, and just over the Kreyenhagen hills to the West of the airport at an altitude just below 3000ft MSL. As the blimp slowly approached, several gliders were qued up waiting to launch. At the head of the grid was Jan Zanutto, the first to take off. 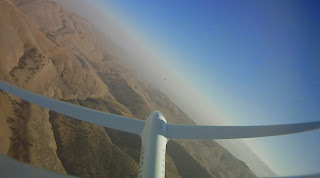 We though we'd all be able to get in the air and get a chance to see and photograph the blimp from our gliders, but it was making remarkably good progress to the South against the headwind, and Jan was the only one who was close enough to it to get a photo from the air before it disappeared in the haze to the South. Jim Rickey got a couple of shots of it from the ground. 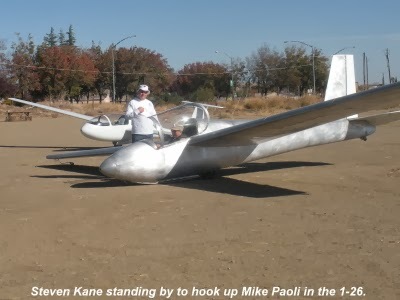 We are going to have to add a new "scenario" to our FAA scenario based syllabus. 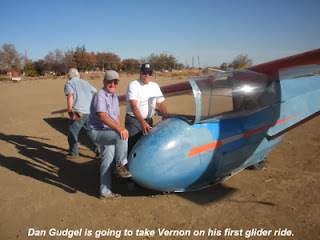 "Lets say you were ridge soaring, going south by Tar Canyon. You decide to make a 180 deg. turn to the left to reverse direction on the ridge. The next thing you notice is your windscreen is full of the front end of the rapidly approaching Goodyear Blimp!. You are sandwiched between the ridge on the left and the blimp on the right. Quick, what are your options?". Before, I would have laughed at the possibility of that scenario ever occurring. 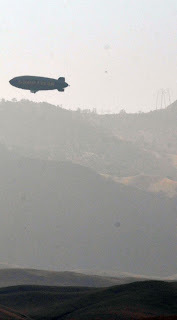 After today's visit from said Goodyear Blimp..... Well, I'm still laughing! Anyway, the possibility is no longer zero. We were very glad to have Harold back in action today. He is over his knee surgery two weeks ago. He was doing fine getting in and out of the back seat of the 2-33. 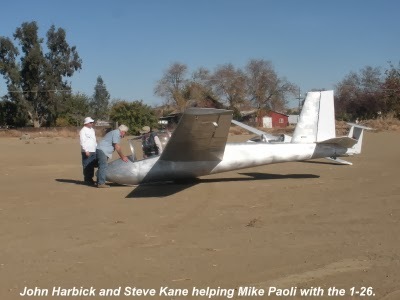 Martin Caskey had 3 flights in preparation for his commercial glider add-on rating which he is working on prior to getting his 15 meter Nugget sailplane back in the air soon. He practiced the Practical Test Standards maneuvers including stalls, flight at minimal controllable airspeed, steep 720 deg. turns to a heading at a 45 deg. bank, accuracy landings, landing with no spoilers using a slip for glider path control, and landing without reference to the altimeter. He also boxed the wake and did a 200 ft. simulated rope break. 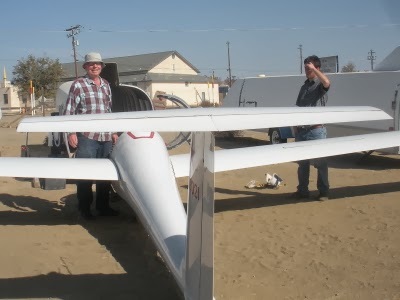 Andy Reisteter and Steve Schery both flew their Russias and were able to sustain for a period of time. 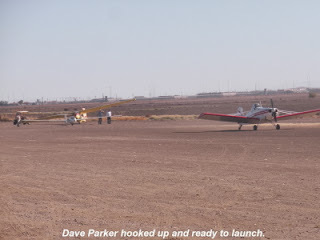 The lift was not very good, but we did have a few dust devils at the peak time of the day. 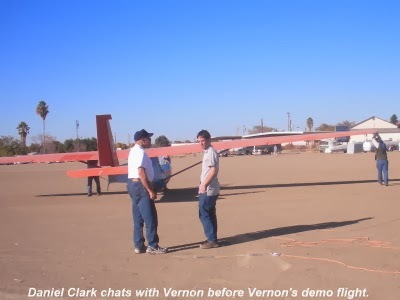 Dan Clark was out early flying with Dan Gudgel in the Orange Crush and stuck around all day helping to run wings and hook up towlines. 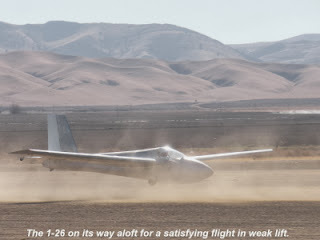 Jim Rickey was out working on his commercial glider add-on rating and practiced boxing the wake, flight at minimum controllable airspeed, stalls, 720 deg. steep turns, slips to a landing without use of spoilers, accuracy landings. 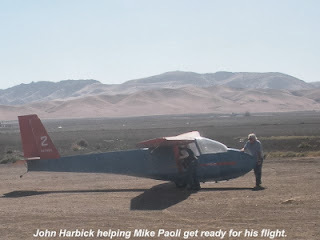 He also pulled duty cooking hamburgers for lunch and helped everybody else with dragging gliders around, running wings and fueling the tow plane. 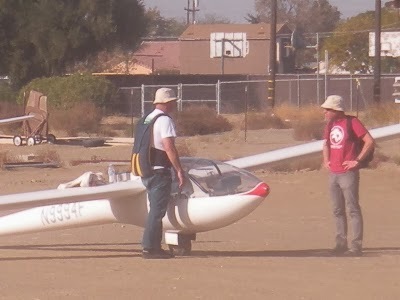 Jeff Richardson was out and flew the 1-26. We had the Pawnee tow plane from Santa Ynez flown by Bill Vrastil, which provided spectacular tow performance. 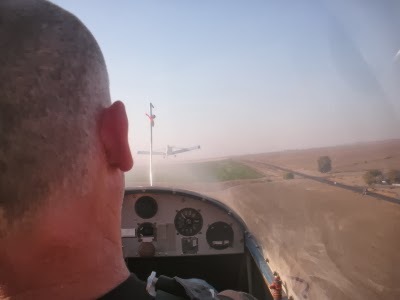 At one point in the morning, we had a Southerly tailwind, but were still able to operate off runway 31, with the gliders landing on 31 and stopping just short of the club house, then taking off from there. In spite of the downwind takeoff and the displaced take off point, the Pawnee was breaking ground just slightly past the tow plane hangar, and was already at about 200 - 300ft AGL by the end of the runway! 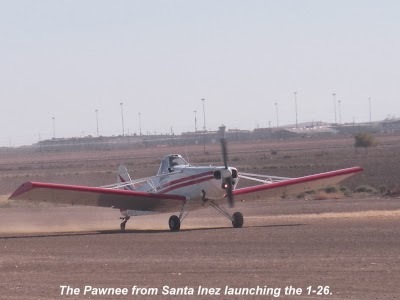 Members helped Bill refuel the Pawnee before he departed for Santa Ynez at the end of the flying day. He holds 42 gallons total, and was down to about 12 gallons at the last top off before departing. Mike McClellan, who has been a member in years past returned today and rejoined the club. He got his BFR completed with Harold. We are very glad to see Mike back with us. He has been a great asset to the club in the past. He single handedly poured the footings for the hangar we were going to have before it was sadly destroyed in a windstorm a few years ago. 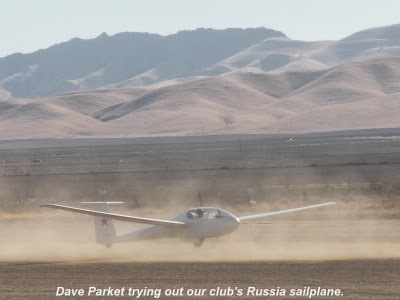 He also was expert at ridge soaring the Blanik and was known for flying it over to Harris Ranch, landing for lunch, and then having Loyal tow him back while he digested his Harris Ranch beef. 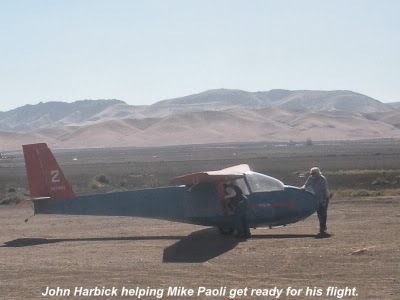 Mike flew as though he had never been away from soaring. So little lift in the afternoon but he managed to remain aloft 42 minutes working a weak area of lift to the northwest near the power lines. For the longest time he managed to remain at 2220 msl not gaining or losing a foot. I don't recall lift ever getting above maybe 50 fpm. So his coordination and smooth flying gave us that much time in the weak area. For those of you who don't know Mike from before, get to know him. He's a fascinating guy and one of the nicest guys I've met in years. As Alex pointed out above, he has been and will always be a rare asset to our club. Welcome back, Mike. Jeff Richardson brings Carl Engle to launch on runway 13 due to winds. 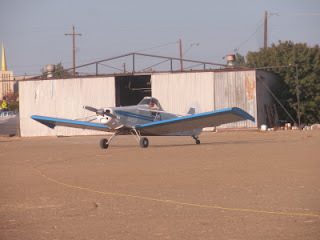 Carl Engle ready to launch on runway 13 at Avenal. Andy Reistetter preparing his Russia for flight. Steve Schery and Daniel Clark work on Steve's Russia. 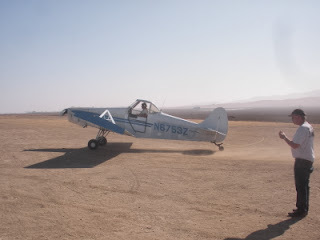 Bill driving the Pawnee, a great tow plane, fun for all of us. Carl about to enter the dust cloud created by the big engine of the Pawnee. Lunch break. 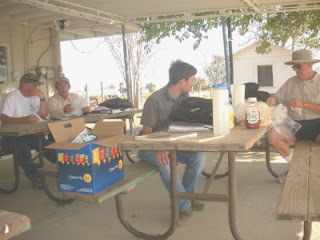 Hamburgers compliments of Jim Rickey. Martin Caskey in training for his Commercial Add-On rating. 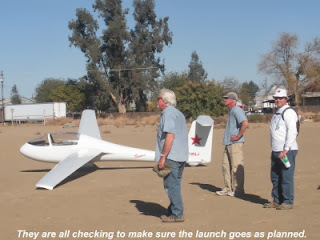 Andy Reistetter about to launch. Carl Engle going for the rope. Jan Zanutto just finished his flight, chatting with Pancho Herrera. Daniel Clark comparing notes with Mike McClellan. Daniel was born and raised in Felton, CA where Mike now lives. Someday it would be nice to have one of these for towing at Avenal. Mike worked this altitude layer for nearly 45 minutes at almost zero lift/sink. Rolling into the dust storm created by the big Pawnee engine. Mike McClellan about to experience a rope break off the Pawnee. 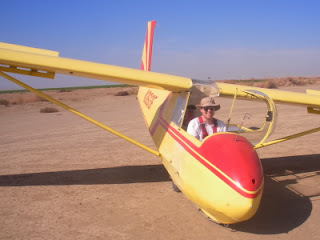 Carl Engel was out and flew with Harold in Big Bird. 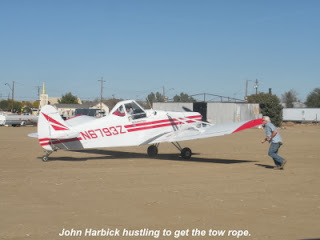 Carl hadn't flown for over a month but that didn't show as he did well especially on tow behind the Pawnee. 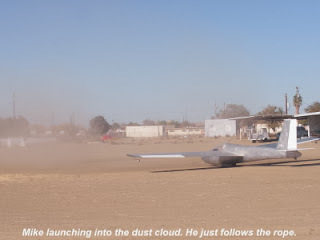 He'll continue working his way towards his Private License doing home study for the written test and getting better each time at flight precision. 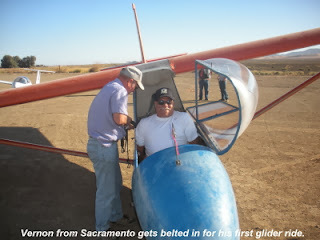 Pancho Herrera came out and flew in the 1-26. He is working on flying the Libelle soon. Next time we have the towplane from Santa Ynez, when scheduling, we need to remember to start operations early by scheduling earlier, as the tow plane needs to leave Avenal about 3:30 p.m. in order to get back to Santa Ynez with an adequate margin before dusk. Today I think we were still in a summer mode, and have not adapted yet to the recent time change. Some people were scheduling at 2:00pm and we still had some who had not flown by 3:15 p.m. 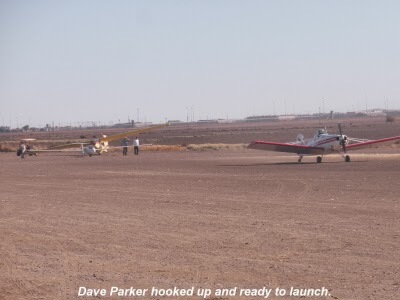 They almost did not get to fly at all before the tow plane needed to leave. Wind: Light out of the North. 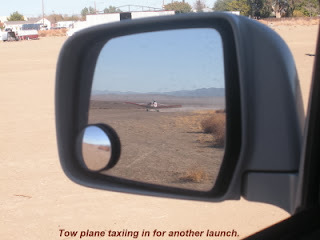 Time Aloft: 5 to 7 minutes off Auto Tow. Comment: Tow plane down. Auto Tow Day declared. Tow pilot: Jeff Richardson volunteered his Powerful 4WD Suburban for Auto Towing, and did much of the driving as well. Following the Auto Towing, everyone adjourned to the clubhouse for our annual meeting, dinner and awards presentation. I neglected to record all the awards, but hope to edit this page and include them soon. Or else another blog page may be created just for the awards. 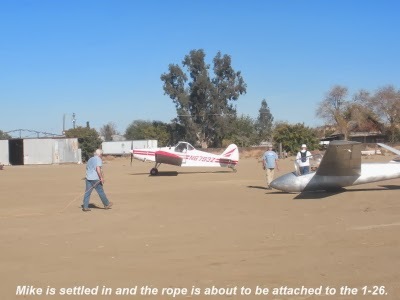 On Jan's last flight, he had a real bone-fide rope break as he pulled into the "full climb". He handled the situation perfectly, and was high enough to make a 180 deg. pattern and land normally on runway 31, rolling out and stopping right at his T-hangar. After Jan's rope break today, which appeared to be just related to the rope finally having enough wear to be significant after about 150 launches, I plan on replacing the 1/4 in line with new rope next week. Jeff volunteered to do one more ground launch operation next week with the Suburban, and should get signed off for the ground launch endorsement next time. 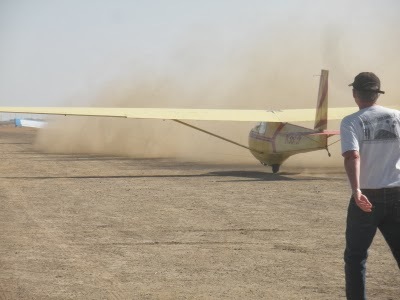 He also plans on flying the 1-26 next week on ground launch.